MIAMI — Human-caused climate change will drive more extreme summer heat waves in the western U.S., including in California and the Southwest as early as 2020, new research shows. The new analysis of heat wave patterns across the U.S., led by scientists at the University of Miami Rosenstiel School of Marine and Atmospheric Science (UM) based Cooperative Institute for Marine and Atmospheric Studies (CIMAS) and colleagues, also found that man-made climate change will be a dominant driver for heat wave occurrences in the Great Lakes region by 2030, and in the Northern and Southern Plains by 2050 and 2070, respectively. "These are the years that the human contributions to climate change will become as important as natural variability in causing heat waves," said lead author Hosmay Lopez, a CIMAS meteorologist based at NOAA's Atlantic Oceanographic Meteorological Laboratory. "Without human influence, half of the extreme heat waves projected to occur during this century wouldn't happen." The study, published in the March 19, 2018 online issue of the journal Nature Climate Change, has important implications for the growing populations in these regions since heat waves, which are the number one cause of weather-related deaths in the United States, have already increased in number and severity in recent decades and are projected to rise well into the 21st century. Lopez and colleagues used climate models along with historical climate data from 1900-2010 to project future heat wave patterns across the U.S. during the summer months of June through August. The climate change scenarios identified four regions where man-made climate change would be the dominate cause of heat extremes, surpassing natural climate variability. The researchers defined extreme heat wave events as three or more days of record high temperatures. "Population growth coupled with the fact that extreme heat is the leading weather-related cause of death in the United States call for the need to identify the relative roles of internal variability and human-caused climate change on these extremes," said Lopez. "This work provides a significant advancement in the scientific understanding of future projections of heat waves." 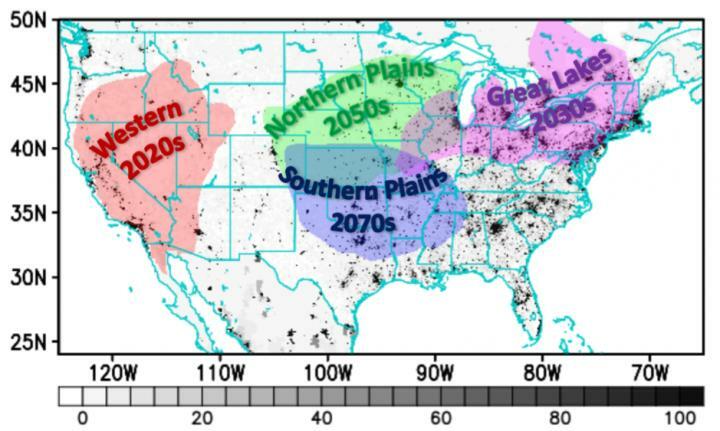 The study, titled "Early emergence of anthropogenically forced heat waves in the western United States and Great Lakes," was published in the Advance Online Publication (AOP) on Nature Climate Change's website, DOI:10.1038/s41558-018-0116-y. The study's coauthors include: Robert West from the University of Florida; Ben Kirtman from UM Rosenstiel School and CIMAS; Shenfu Dong, Gustavo Goni Sang-Ki Lee, and Robert Atlas from NOAA's Atlantic Oceanographic and Meteorological Laboratory. Funding for the study was provided by the NOAA Climate Program Office (GC16-208 and GC16-207), NASA grant NNH13AW33I, and the U.S. National Science Foundation (OCE1419569).